Government job vacancies in Banking sector for officer posts throughout India. 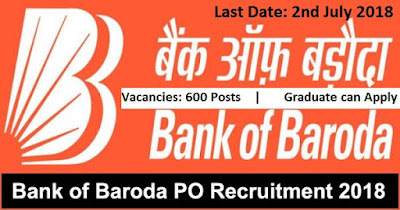 Bank of Baroda Recruitment for Probationary officers in various branches of banks. There are total 600 Government job vacancies which are going to filling up through this BOB Recruitment 2018. BOB is looking for energetic, young fresher graduate candidates for these bank jobs in India. Bank of Baroda recruitment department is inviting all Indian eligible candidates for this bank recruitment process. Online Government job applications are invited from all eligible graduate candidates of India. More information related to this Bank of Baroda recruitment process is given below in this article. Read the complete article carefully before moving to online application form. We share different sections related to this Bank recruitment process below. Candidates who are wishing to apply these Government jobs in India must satisfy the following criteria which we explained in the table below. Those who satisfied these criteria can apply online for this Bank of Baroda recruitment 2018. Those who are wishing to apply for these Bank jobs in India must have a Graduation degree with minimum 55% while 50% for SC/ST/PWD category candidates. Candidates having age in between 20 years to 28 years can apply for this BOB Recruitment 2018. What is the Application Fee for applying this BOB Recruitment 2018? Candidates from all over India can apply for these Government job Vacancies by paying the following application fee which we explained below. Different category candidates have to pay the different application fee. Can pay the fee through the following ways: “Debit Card / Credit Card / Internet Banking”. What is the Process for applying these Government job Vacancies? Bank of Baroda is going to conduct online examination for the selection of the candidates. The first online test will be Objective Test after that the second test will be Descriptive test. After that Group discussion and Interview round will take place for final selection. What is the Process for Applying this BOB Recruitment? Bank of Baroda is inviting online application for these Government job vacancies. Those who are interested in this Bank of Baroda recruitment can apply online through the officially website of the bank. We share the link below for applying online. Just click on the link and you will redirect to the online page for applying. 12th June 2018 is the Starting Date for applying. 2nd July 2018 is the Last Date for applying. 28th July 2018 is the Date of Exam.